Donatus cutters may lack the name recognition of many other cigar cutters, but these German instruments are serious cigar tools. The company has been crafting sharp cigar tools since 1959 in the town of Solingen, Germany—known as Germany’s “City of Blades,” and the home of most German knives, including Wüsthof and J.A. Henckels. 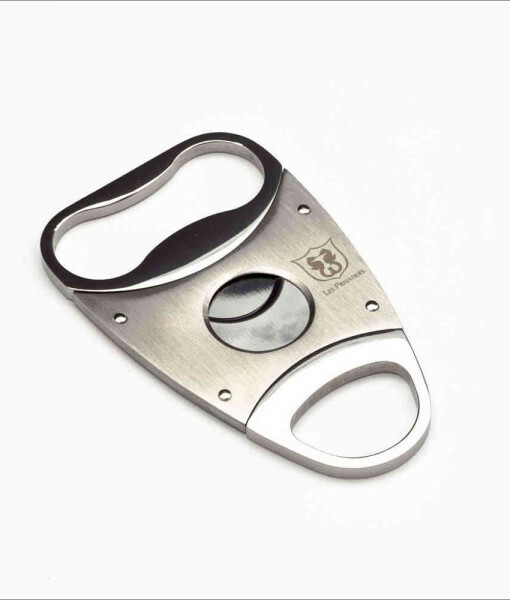 The Donatus Triple-Line Cutter is the company’s flagship item, a sturdy and masculine double-bladed cigar cutter that is very wide but relatively thin. The cutters are three-and-a-half inches long when closed, one inch longer when extended, and two-and-a-quarter inches wide at their widest point, but only 3/16 of an inch thick. They were designed by Lars Krysiak, chief executive officer of the family-owned company, and are meant to be used with three fingers. The Donatus Triple-Line delivers clean, precise cuts worthy of the Solingen reputation. The cutter is a bit large for the pocket, but feels good in the hand—your index and ring fingers seek out the wider of the two handles while your thumb finds a home in the more narrow opening. The cutter comes in a satin of finish.